More Freedom Within a Framework builds upon the ideas identified in the successful Freedom Within a Framework , but is more than just its sequel. This second book aims to develop Anglican worship even further by encouraging creativity and open worship to combine with the liturgy provided in Common Worship. Eighteen contemporary service outlines are provided in a ready-to-use format, covering Services of Holy Communion, Services of the Word and Services of the Word with Holy Communion as well as introducing the concept of Liquid Worship for which a service outline is also included. A CD ROM is also provided which contains PowerPoint presentations for two of the services within the book. However you decide to use the ideas and outlines offered in this book, they will help build worship that is full of life, bring personal and corporate growth and open out your services into times of renewal where God can move in power. More Freedom Within a Framework: Breathing New Life into Liturgy - A Common Worship Resource by Tim Lomax was published by Kevin Mayhew in September 2002 and is our 21930th best seller. 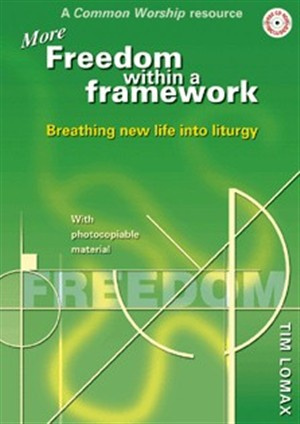 The ISBN for More Freedom Within a Framework: Breathing New Life into Liturgy - A Common Worship Resource is 9781840039405. Be the first to review More Freedom Within a Framework: Breathing New Life into Liturgy - A Common Worship Resource! Got a question? No problem! Just click here to ask us about More Freedom Within a Framework: Breathing New Life into Liturgy - A Common Worship Resource.